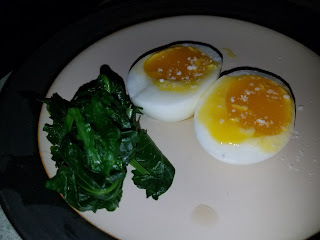 “What seems to us as bitter trials are often blessings in disguise"
I started out today with a delicious breakfast of steamed broccoli rabe and a soft boiled egg with a pinch of sea salt. 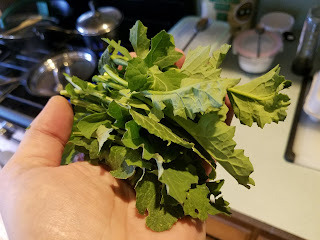 In our garden we have one medium sized patch of broccoli rabe that popped up as the first green crop of the season - beating out the asparagus patch by a nose. The asparagus are coming - I can see their tips starting to break ground level. There was one full stalk that I ate raw on the spot but I'm guessing in about a week there will be many more to harvest. In the mean time, the broccoli rabe has been fantastic. I'm trying to ration wisely and only trim off enough from this patch for each serving. 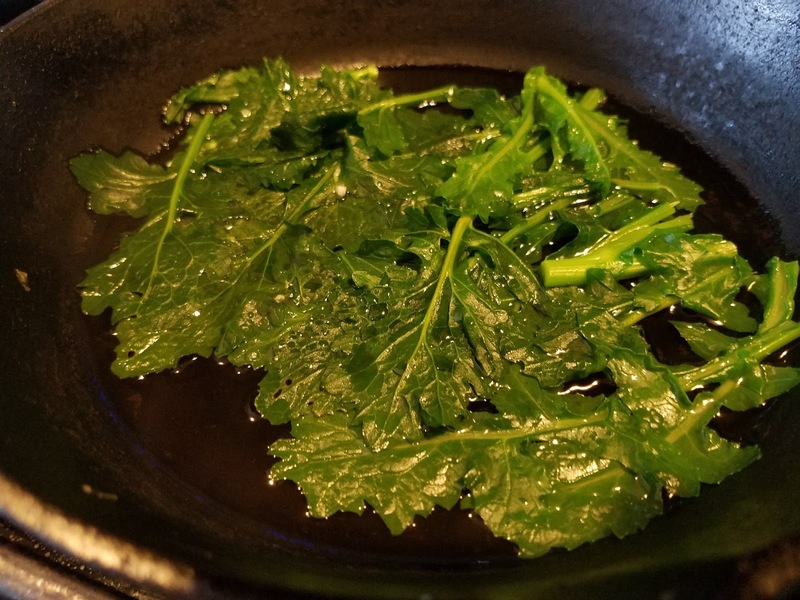 It's got a slight bitterness but not nearly as bitter as dandelion greens. I know the dandelions pack the most nutritional benefits of anything I have to eat but I still just can't get past the taste. I'd have to be pretty desperate to have a dandelion salad again. I had one many years ago and the memory of that still troubles me. I had a pretty easy day at work and I didn't pack any lunch. When I came home around noon I had another egg, some rice and water. I've really been overindulging in my egg gift. I'm not doing a very good job of rationing them. I ate another for dinner. Maybe tomorrow I'll try to lay off the eggs as I have some plans for my trout. I spent about an hour today de-boning all of my cleaned trout. I think there were 13 fish in all. I did a little YouTube research and figured out the method I will use to smoke and preserve my fish for long term. I used salt and honey as a brine and have my fillets soaking in it overnight. Tomorrow the plan is to dry the fillets and then test out the new smoker. I unpacked the smoker which was no small task. I didn't realize it had to be assembled. It took over an hour just to put it all together following pretty poor instructions. It looks fairly simple to operate. After I dry my trout I will put the smoker to use tomorrow. Speaking of tomorrow, this day will conclude my first week and therefore I will receive my first reward - butter and spices. Say goodbye to the bland food and hello to butter! The first week is always a challenge with all the bland food. I have to say however, that broiling the trout, making the sea salt and the broccoli rabe have all added quite good tastes to my meals without seasoning. Not to mention the egg yolks. They are quite yummy. Looking forward to some new flavors tomorrow. As I type this, my super smelling is detecting hamburgers cooking downstairs. It's 12 AM and Ty is cooking up a midnight snack of burgers and it smells amazing. I can almost taste it. I want to go lick the burger fat off the bottom of the pan. No luck so far with the squirrel trap although the 'walk the plank' trap has gone off twice. I think the squirrel is able to just away before landing in the can - or it jumps out of the can. I haven't witnessed it yet. I put a Gopro camera to work to try to get a video but so far nothing. The tube trap is not working either. I tried fishing for trout again today and I got skunked for the first time, It was quite nice outside today hitting the mid 70's and sunny. I'm thinking the trout did not like this sudden heat wave. A large goose was paddling nearby while I was fishing so I took a cast in his direction. I had thoughts of 'accidentally' snagging the goose with my fishing lure but it was out of range after my first attempt. 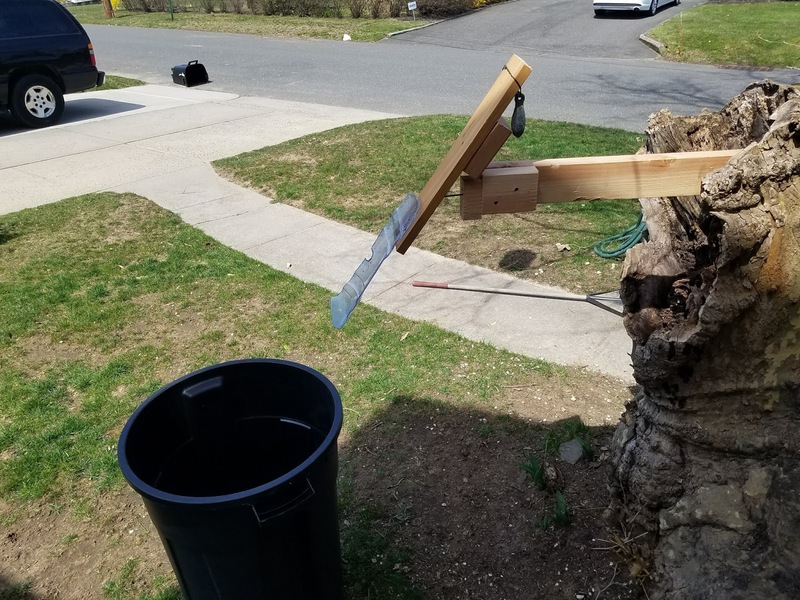 Still trying to come up with a duck or goose capture plan.